A complete 3D printing system including HD 3D printer and matching resins. Perfect for the production of working models, occlusal splints, drilling templates, individual functional trays, transfer trays for the indirect bonding technique and gingival masks. IMPRIMO® is fast, accurate, cost-effective and easy to use. 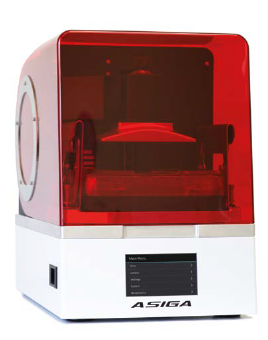 The compact desktop HD 3D printer Asiga MAX™ is the latest element of the IMPRIMO® 3D printing system. It combines intuitive operation with fast, precise printing results. The built-in LCD panel with touch-screen functionality provides real-time information about the building process and enables interactive control. HD chip, the Asiga MAX™ is equipped with an internal light sensor ensuring a constant projector performance. Every moulded part on the platform is cured in the same reliable print quality, with very low chance of build failure. The proven DLP technology and the wavelength of 385 nm guarantee a high building speed and clear-transparent splints. The tray system allows easy changing and refilling of materials, as the integrated RFID chip informs the operator when the tray needs to be replaced. The entire printing process can be controlled remotely via a web browser. The internal solid-state drive allows storing of multiple print jobs which can be transferred and started via network cable or Wi-Fi connection. The Asiga MAX™ can also operate as a wireless hotspot for an independent production solution. Printing jobs can be created using Asiga Composer software, which is included license free with every system. Superior part quality due to the use of anti-aliasing during the printing process. Support is provided for the life of this product. To find out more about Asiga Max, please get in touch. Find out how 3D printing is taking hold in top dental laboratories, in this article by master dental technician Andreas Hoch (Dental Technik Kiel, Bonn). Light-curing resin at the base of methacrylate for fabrication of high-precision dental models with smooth surfaces, ivory. Compatible with 3D printers with 385 nm light source. Click here to find out more, or to buy online. Light-curing resin at the base of methacrylate for fabrication of high-precision, transparent occlusal splints and drilling templates. When cured, the resin is characterised by relative flexibility and provides high wearing comfort, reduced breakage and excellent polishing properties. Contains no diluent monomer.